Seriously I need your help to cure my syringoma. Is Syringoma Removal using lasers painful? I came across your website for Syringoma removal peels. I am very interested. However, I have a rare case of Syringoma on my labia majora, and it has been getting worse through out the years. I’ve been to numerous dermatologists and they do not recommend surgery/laser surgery because of the delicacy of the location. I was getting them burned off but there are too many and the pain from the procedure and recovery was not worth it due to the burn I felt when I used the bathroom or if anything rubbed against it. I was wondering if the peels would work for me instead. I just need to do something about it because I am very self-conscious about the syringoma and it is very uncomfortable. I know this does not cure it but if they were less visible I would feel so much better. If you can please get back to me as soon as possible that would mean a lot. Syringoma can appear on any part of the body. As you describe they can be burned off in many ways. It can be with the use of lasers, Cryotherapy or simple electrofulguration. The latter is the preferred way used by both aesthetic professionals and dermatologists. We seem to understand that the issue is not merely aesthetic in your case as also medical. If Syringoma or Syringoma looking lesions are inflamed and they should be seen by a local dermatologist, as they are the best professionals who can help you. Additionally your Syringoma seem to affect your pubic region, therefore the best help you can get is from your dermatologists. Therefore you have done the right thing by seeking their help especially if the lesions are uncomfortable or inflamed and in your pubic area. We have seen many cases of Syringoma and one of the main problems with them is that the recurrence rate is an issue, sometimes no matter how they are removed, they keep coming back and unfortunately, there is no known way to stop the recurrence. If these benign lesions recur they will do so despite of the means used to remove them. Therefore we recommend to avoid the use of any peels and keep seeking medical attention AT YOUR EARLIEST CONVENIENCE as you have done so far. I have syringomas and I would like to try and remove them with a peel because the electrolysis did not work. I live in South Africa and I cannot at this moment afford the syrinremover. I did, however, find glycolic acid 50% which I can afford. Is it safe to use it, and if so how much do I need to apply to start seeing results? Electrolysis (Electrofulguration), lasers, chemotherapy, all physically remove the syringoma, however in some cases they keep coming back. They come back so quickly that even if they have been physically removed, by the time the area has received they are there again. For this reason the use of sometimes very expensive lasers or similar although they are expensive they do not seem to work. In our opinion the devices cannot be blamed, it is more a recurrence problem. We understand that our product is not the cheapest, therefore not everyone can afford it. There are many different types of peels on the market and they work in different ways depending on what you buy and what active ingredients you have in them, whether they come in a liquid solution, their PH etc. Depending on the formulation you may need a neutralizer. Therefore we are unable to tell you how to apply other peels and provide any advice as the results you may have with them or whether you should use them at all. We have tested our product extensively and it has also been used extensively worldwide, therefore, we can tell you how our SyrinRemover work. Hello there! My name is ____________ from __________! I have had syringomas for the last 16 years, and it seems to be getting worse! I would really like some advice on what I could do to get rid of them, as with them getting worse it is affecting my confidence!! Any suggestions would mean the world! Syringoma are benign lesions removed for aesthetic reasons. Therefore even is they seem to be getting worse this is very unlikely to affect your health. There is actualy no known scientificly proven risks in keeping Syringoma. They are usually addressed mainly for aesthetic reasons only because the person who has them finds them embarassing. There are many ways to remove your syringoma on the neck and since they are an aesthetic issue there are many alternatives. You can check them out also on our website by clincking here. 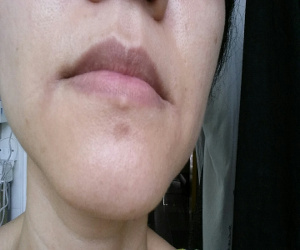 1) I did a patch test on my chin but I guess it could be too much gel tat the scab form n leaves a brown spot..it has been close to 2 weeks.. I’m not sure will it slowly recover back to normal skin? attach 2 pictures for your advice. 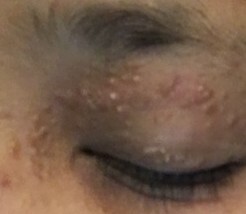 2) I applied some gel around my eye area..some leaves a scab..but I notice there are 1 or 2 spots that no scab is formed even though I have applied some gel on that spot for 20 minutes n the area sting..is this normal? that area looks normal like nothing happen. can I reapply again the same spots after 1 or 2 days later? thank u for your help! 1) The patch test has to be done underneath the chin area and on the wrist. It can also be done on behind the ear. In you case you seem to have done it just above the chin. As you have seen in the instructions the gel has to be kept for a very short period of time (a few minutes, see instructions on how to patch test). This type of brown spot could have been formed due to indirect UV exposure. By the look of it the darker area should fade over time. The true hyper-pigmentation issue arise usually due to direct-sun exposure and the brown spots look much darker than what you are showing on this patch tests results. During our internal tests we have seen only one similar occurrence and it was clearly caused by a certain degree of UV exposure. This spot has now gone on our test subject. It took in the region of 8 weeks for the brown spot to disappear. What we recommend you do is wear total physical sun block and avoid direct sun exposure and much as you possibly can. In this way the brown spot will subside by its own accord, however further sun exposure could darken the area further. 2)During a full application, it is important to clean the area properly. The skin normally produce a natural layer of protective substance which is meant to protect the skin from esternal agents. This has to be completely removed by washing your face thorough before full application. It is possible that some of the Syringoma had some or residues of this protective layer which slowed the action of the gel. The thickness of the gel itself. The thicker the gel the more the effects of the product. conversely the thinner the layer of the gel applied the mild the effects. The patch tests are ment also to let you understand and learn these very useful effects. As you know you simply stop the action of the gel when you want by wiping it off and rinsing with water. To summarise what you describe sounds very normal. Please do reapply on the same areas two weeks after the previous application as long as there are no sign of any peeling effects. Hi I’m from Australia..I need info about this product that you are selling..how much for it? I did almost everything..but they still visible…if I apply this do I need to have time off work? Please reply..
Dear ________, Thank you for your enquiry. We can dispatch the SyrinRemover to Australia. We strive to make all the information available on-line. SO you should be able to find the specific information on our website. Please click here to read the Frequently Asked Questions about the SyrinRemover, this may help. Also you can see how we answered to some other enquiries by clicking here. If you do not find the specific information you are looking for, please feel free to get in touch and we will happily answer your specific question. You can find the price on our website, please click here to find out. You mention you did almost everything but the Syringoma are still visible. Unfortunately we hear this complaint from many people, this is one of the reasons we introduced the SyrinRemorer. As it is well known, Syringoma have a fast and high concurrence rate. Therefore many people are very disappointed to find out that their Syringoma they have just had removed with expensive treatments are back just as quickly as it takes the skin to recover. With the SyrinRemover the recurrence rate will not be such an issue, as you have the right product to remove them right at home. Therefore you can keep applying the product if they recur. You ask whether you will need time off work. This is not strictly required for most jobs, provided that your job will not increases the chances of infections during the scabbing process. The scabbing process usually lasts between 5 to 7 days, but is can be less. Hello. I am currently 22 years old. I’ve had Syringoma since I was in the third grade. They were small and wasn’t too noticeable until I entered my 20’s. I got pregnant at age 20 and these bumps sky rocketed! They are all over my upper eye lids, bottom eye lids, nose, & forehead. I pretty much did everything from burning it, freezing it, slicing it open and squeezing it out. I want to know how many treatments do I need to take of this? Thank you for your help! Dear Enquirer, many people turned to us as the last resort after they tried all possible ways to removed them. The main problem with Syringoma is that they can be quite persistent and despite the efforts you make to have them removed, they seem to grow back just as quickly as they have been removed. This is the main reason for us to come out with the SyrinRemover. Although there is not known way to reduce the recurrence rate, the SyrinRemover is just as effective in removing Syringoma as any other methods, including lasers. Therefore the main advantage you have with the SyrinRemover is that you can remove them a many times as you please. The SyrinRemover gel comes in a 30 ml bottle or jar and , on average, it is sufficient to remove Syringoma for one entire year. Going back to the question as how many treatments you may require to remove them, as the SyrinRemover is formulated to vary its effectiveness according to the duration of the application, you can even remove them in one session. However they can grow back just as soon as they have been removed, and when the scabbing is over you may find that they are smaller (sometimes apparently of the same size) but they are still there. At that point it is simply a matter of persisting in removing them over and over again until their appearance as improved to an acceptable level. Therefore if you have a recurrence issue with your Syringoma the SyrinRemover will allow you to repeat the treatment over and over again until you are satisfied with the results. This is one of the reasons for also providing a money back guarantee option so that you will know that we are confident you will be pleased with the results. To date no one has retuned a single SyrinRemover.